President Trump doubled down on his weekend attacks against John McCain in light of new evidence about the Trump-Russia dossier. Starr, on “Fox and Friends” Saturday, said, "I think he was an American hero. But I’m very sorry he got implicated in this in terms of spreading this very nasty stuff around." The unverified 35-page dossier, which was leaked to media and published by BuzzFeed in January of 2017, alleges the Trump campaign colluded with Russia to defeat Hillary Clinton in 2016 presidential election. 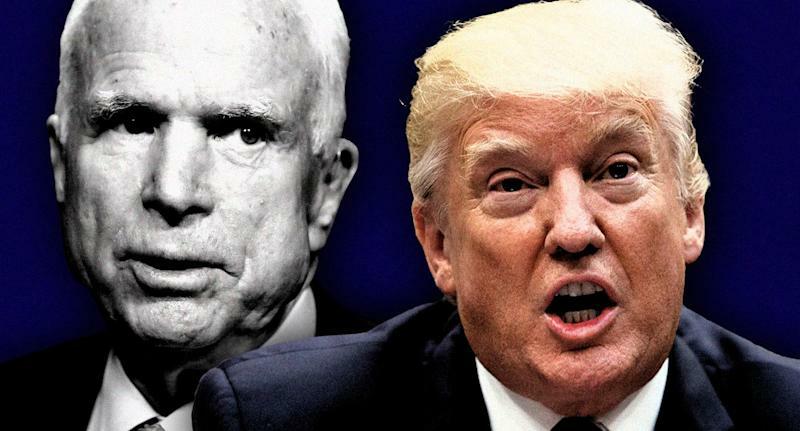 It had been reported that McCain was involved in disseminating the leaked dossier, which was compiled by former British spy Christopher Steele. The Steele dossier was one of the starting points of special counsel Robert Mueller’s investigation. Mueller is believed to be preparing a report for the attorney general. A resolution recommending that Mueller’s report be made public was approved by the House unanimously last week. “So it was indeed (just proven in court papers) ‘last in his class’ (Annapolis) John McCain that sent the Fake Dossier to the FBI and Media hoping to have it printed BEFORE the Election,” Trump followed up in a tweet Sunday. Recently unsealed court documents show that an associate of McCain, former State Department diplomat David Kramer, had shared copies of the dossier with BuzzFeed and other media outlets. But this was not “BEFORE the Election,” as Trump boldly claimed, because Kramer testified he only was briefed on the dossier by a former British diplomat on Nov. 19, 2016, nearly two weeks after Election Day. McCain had also been briefed and then in the following weeks gave the reports alleging conspiracy between the Trump campaign and Russian government to former FBI Director James Comey. "I discharged that obligation, and I would do it again,” McCain wrote. “Anyone who doesn’t like it can go to hell." “My father lives rent free in your head,” Meghan McCain later tweeted at Trump, but then deleted. John McCain had been tortured and held as a prisoner for over five years during the Vietnam War, refusing offers of early repatriation ahead of his fellow POWs. Trump received student deferments during the war, and eventually was declared ineligible to be drafted owing to a “bone spur” in his foot. He never served in the military.